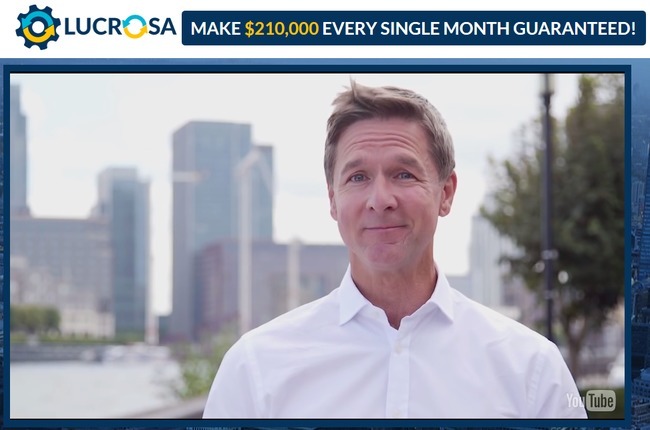 Lucrosa Scam Review - A Hideous Money Trap! 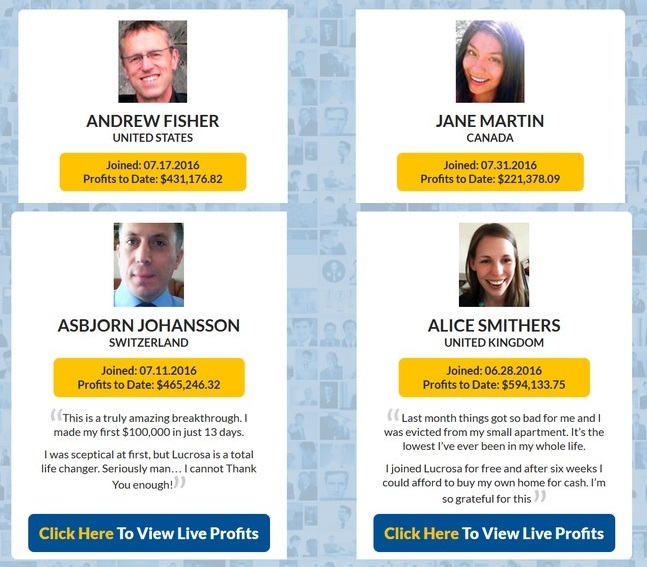 Lucrosa Scam Review – A Hideous Money Trap! Lucrosa binary trading software is another online opportunity that seems too good to be true, and indeed it is – because Lucrosa is a scam! We’ve had multiple readers who lost $250 each, so take a step back if you are considering to fund your account. Read through our full Lucrosa review as we uncover the various evidence we have collected about the scam. Binary trading software scams have been around for a long time, but we seldom see one that makes a claim as outrageous as Lucrosa. I’m sure most people would scoff at it and close the random pop-up window, but there are bound to be inexperienced victims who think it’s possible. If you are skeptical of their claims but at the same time afraid you are passing up an opportunity of a lifetime, this review is for you. This Lucrosa review shows you the major red flags within the scam, tips on how to avoid similar scams in the future, and lastly the real way to make money online. Let’s take a look at the first evidence that proves Lucrosa is a scam. Success stories of other members are always inspiring, but you have to be careful when it comes to questionable online opportunities. The testimonials showed in the screenshot above can be found right below the sales video at Lucrosa’s homepage. These profiles are complete with their pictures, names and profits to date. Every single one of them claims to have made close to $500,000 within a short month or two, but don’t be thrilled. All of these members have been featured in one scam or another. Try to compare the pictures in the screenshot above against the ones in Lucrosa scam. 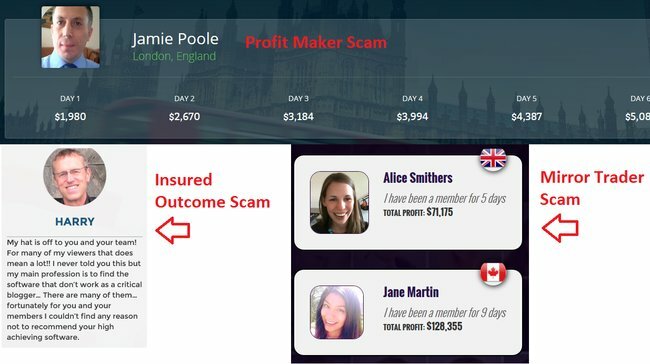 We’ve reviewed all of the scams mentioned above, and here’s the links to the reviews: Profit Maker, Insured Outcome and Mirror Trader. We have every reason to believe all these scams are related to one another, because the member pictures are often recycled, just with different fabricated names in different scams. These members do not exist, and these testimonials are just a marketing tactic used to lure victims into signing up for the scam. Are There Only 21 Member Spots Available? Throughout the sales video, John claims that you are lucky because he is opening only 21 free spots to his trading software. Once these 21 spots are filled, the offer will be taken down, and you would have lost your once-in-a-lifetime opportunity forever. If you scroll down the sales page, you can see a counter showing the number of member places available (see screenshot above). As time goes by, the number of available spots dwindle towards zero, indicating that people are quickly taking up the remaining spots. But the real question is – is there really a limited number of spots? Fortunately, there is one easy way to find out – simply by refreshing the webpage by pressing F5 on your keyboard. As you refresh, you’ll realize that the counter resets itself to 21 spots again, no matter how many spots were left before the refresh. How is that possible? The truth is – there are no limited spots to Lucrosa scam. The number shown in the counter is just a computer script, where it is programmed to count down from 21 every time the webpage is loaded. The fake counter is there to apply pressure to its potential victims – so that they feel compelled to sign up quickly or they’ll lose the chance forever, leaving them no time to think about it rationally. How often do you read the terms and conditions of a product? In the case of Lucrosa, taking the time to read it might save you a hefty sum of money. As much as Lucrosa scam wants to keep you in the dark, they have to reveal the true nature of the scam somewhere in the website to keep themselves out of legal issues. Therefore, they chose to hide the truth deep within the disclaimer document, where the vast majority of victims won’t even read it. You can’t find the disclaimer anywhere in the sales material, because it is supposed to be hidden from you. You can only access it through a fine print at the bottom of the page that reads “risk disclaimer”. You can access the original disclaimer at this link to authenticate our claim. The Lucrosa promotional video is fictitious and was produced to portray the potential of Lucrosa 3rd party signals software. 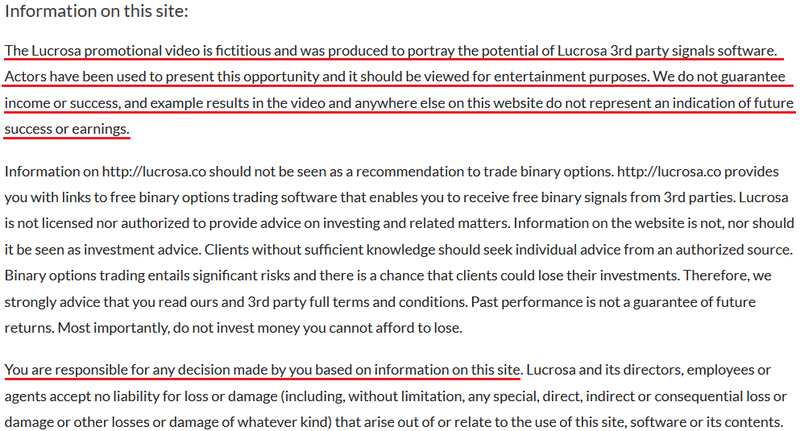 If Lucrosa isn’t classified as a scam, I don’t know what is. The risk disclaimer is clearly just a legal tool for the scammers to escape from the blatant lies they have made in the sales video. LUCROSA IS A SCAM. We strongly advise you to stay away from the scam if you don’t want to lose your hard-earned money.